Similar to Google Chrome, YouTube has now integrated Incognito Mode into its Android app that allows users to privately watch the videos without getting tracked. 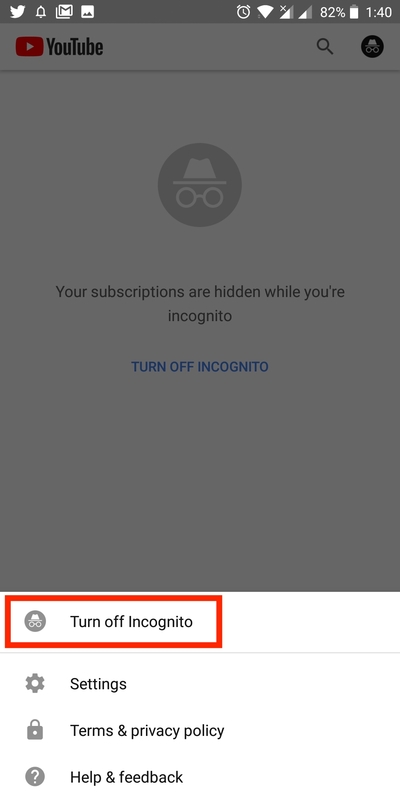 Incognito mode for YouTube for Android was first spotted by Android Police earlier this year. The feature was introduced as a part of A/B testing to a small set of users and it now seems to be rolling out to everyone on Android. With Incognito enabled, your search and viewing history won’t be recorded and your subscriptions are hidden as well. While you’re in Incognito, a “You’re incognito” message appears throughout at the bottom of the app and your avatar is replaced with an incognito icon. Prior to the Incognito feature, one could get the same functionality by toggling on the pause watch and search history options from Settings > History & privacy. This feature works similarly as when you log out of YouTube app and access it. Thankfully, the new Incognito mode option makes it way easier to get the job done in a few taps. Open YouTube app and tap on your profile avatar from the top-right corner. Tap on “Turn on Incognito” option. You’ll now enter into Incognito. The app will clearly show that you’re in incognito mode. To turn it off, simply tap the incognito icon from top-right and select “Turn off Incognito”. It’s worth noting that while in Incognito, you won’t be able to view your search history, subscriptions, notifications, and library. 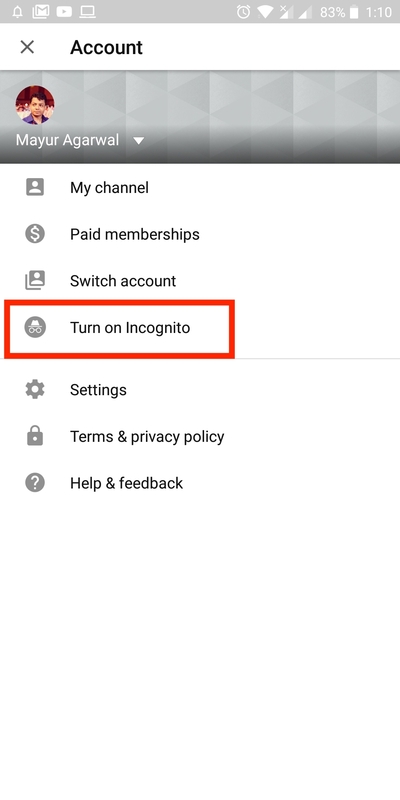 Moreover, you won’t have the ability to like, dislike, report a certain video or even subscribe to a channel while the incognito mode is active. 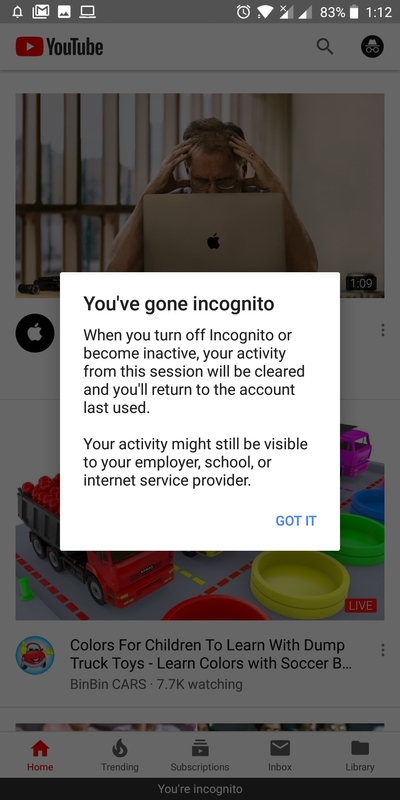 It also seems that Incognito mode automatically turns off after a period of inactivity and you’ll be logged back into your account. We’ve noticed the feature enabled on YouTube version 13.24.59 despite a new update pending. Thanks for it. 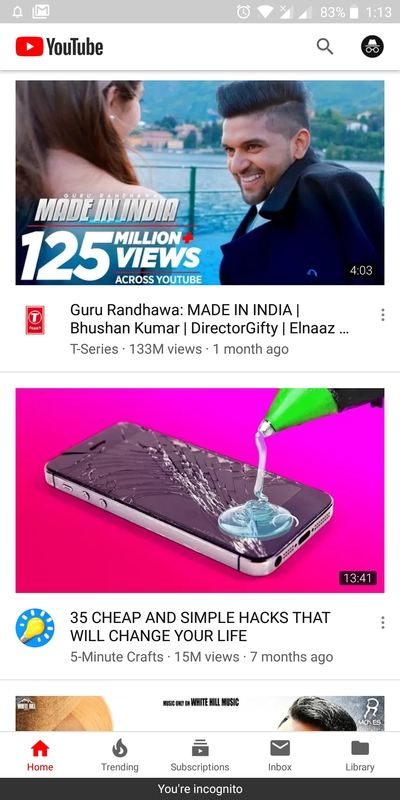 Yes, that\’s the new feature by YouTube. Wow After Chrome, YouTube Also gives us an Incognito Mode that\’s a really really good news. Uh huh, suuure… What they mean is it doesn\’t record your search history and viewing history on your device. You better believe they\’re still tracking you one way or another.